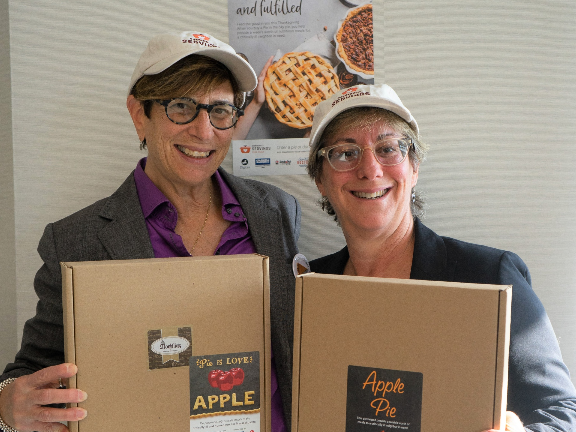 Since 2003, our team has sold Thanksgiving fundraising pies to support Jamaica Plain non-profit Community Servings. The proceeds provide hearty home-delivered meals to people living with acute illness. This year, we’d like to set another fundraising record. Would you help us reach our fundraising goal by November 16th? With your support, Community Servings can continue to help those in need. Pies cost $30 and can be picked up at a location of your choice. The proceeds from one $30 pie provide one week of medically tailored meals prepared and delivered to critically ill neighbors. If you live out of state or are unable to enjoy another Thanksgiving pie, we hope that you’ll consider making a donation or buying a pie for a Community Servings client. We partnered with Team Pie It Forward to sell as many pies as possible this year. Click here to watch a short video – and look for us near the end!